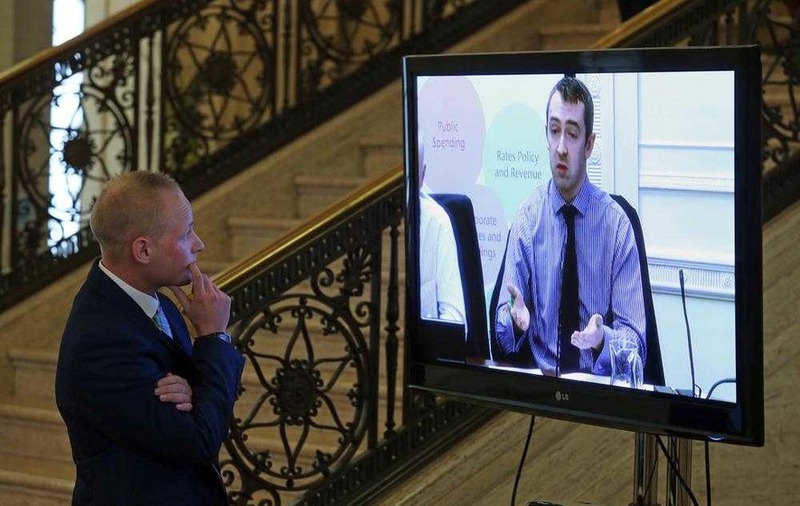 Jamie Bryson watches Sinn Féin MLA and former chair of the finance committee Daithí­ McKay before he appeared at the Nama inquiry in September last year. 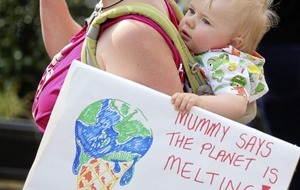 Picture Mal McCann. 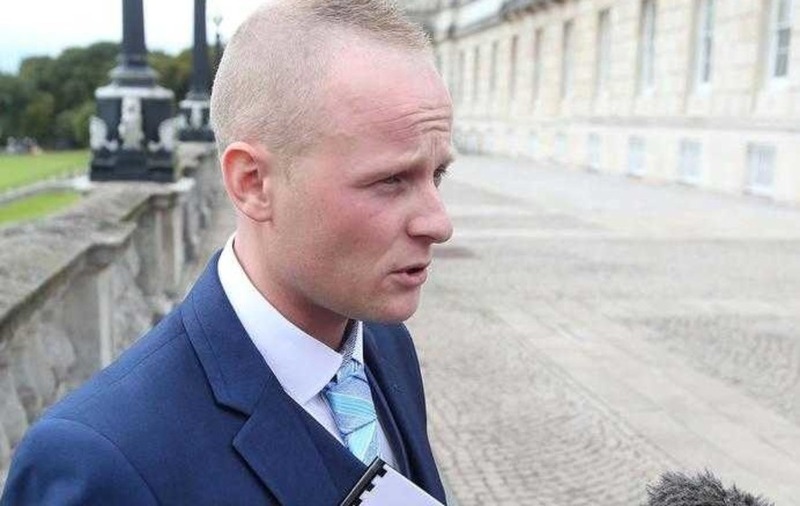 READ a selection of the exchanges between Daithí McKay, Sinn Féin member Thomas O'Hara and Jamie Bryson in the days leading up to the committee hearing. Daithí McKay: So you have : Primary evidence of accounts relating to the sale of the Nama property portfolio. Jamie Bryson: Yes I have accounts relating to companied and their refinancing of their Cerberus loans. Daithí McKay: What should tick the box for the committee for public session in terms of your response, and I will be saying this to other witnesses, is - a direct link you have with anyone in Nama, dfp or advisory committee re this issue. 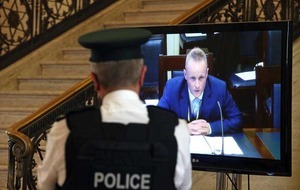 Jamie Bryson: I have a box of documents relating to Millmount. I can provide documents but I can't reveal my source. Thomas O'Hara: It is my view that Daithí wants as much out as possible. If you play this right you will get most of your material out and will be better that Graham's testimony. Fact you have a lot of documents adds a lot of credibility. Remember documents submitted have privilege too. 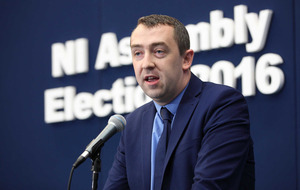 Thomas O'Hara: Daithí only one that can hit the button or tell the clerk to hit the button. But if it gets to the point that the majority of members are pushing him for it he may have to. You have to ensure that it doesn't get to that point. If I were you I'd avoid entirely having a go at the Alliance and DUP in your opening statement. That will make it much harder to put pressure on the chair. Have a go at the when it gets to the q and a and when the damage is already done! Thomas O'Hara: A wee suggestion for your closing paragraph. When talking about Robinson refer to him as 'Person A'. So say all you have to say about him referring to him as Person A. Then in your final line say: 'Person A is Peter Robinson MLA.' Means that the committee cannot interrupt you and means that you don't have to say Robbo's name until the very last second. So then it's job done! Thomas O'Hara: "Give serious consideration to giving one piece of your file such as one letter to the committee ahead of the vote. At the moment it could swing against you. What could you give?" Thomas O'Hara: Texted Daithí there, he says they will be putting a statement out ahead of the meeting tomorrow sometime. 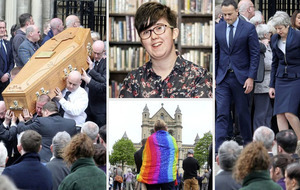 Hold the documents back for now, depending on how he interprets them it could put the frighteners on (John) McCallister. Best to get a read of him first.